I hope you’re having a great Wednesday! I am sitting on the sofa and nursing my soreness. Monday’s soccer practice got me pretty badly. My glutes and legs are absolutely sore now. I know it’s gross but I love it 😉 Yesterday was one of those terrible Tuesdays and it was a long day on top. So I’m lucky I can sit on my couch and just devote myself to all the lovely foods! Tuesdays are always terrible workdays. All my colleagues are in the office and you can’t follow a single of your thoughts as literally every other minute there is somebody knocking on your door and asking for advice, a stapler or a coffee break. Tuesday is the day where as well everyone at the University seems to work. The law departments calls back, our accountant annoys the hell out of me, HR realizes that they couldn’t finish the payroll because they couldn’t find the assistant’s contract extension… For me Tuesdays are the days where I never plan on getting something done. I just let the day flow and try to appreciate the craze by drinking lots of coffee and keep my brain free of as much gibberish as possible. This morning I got up and dragged myself to the kitchen. I prepared some great meals for me and Stefan and off we went. I already had a headache and was a little absentminded and had to run back twice as I forgot some stuff at the apartment. I was pretty hungry and tired and the coffee didn’t succeed at his usual job to get me started. I had to drop off some paperwork at the university admin building before I went to my office. Then finally I had meal #1 which was a bit of a disappointment. 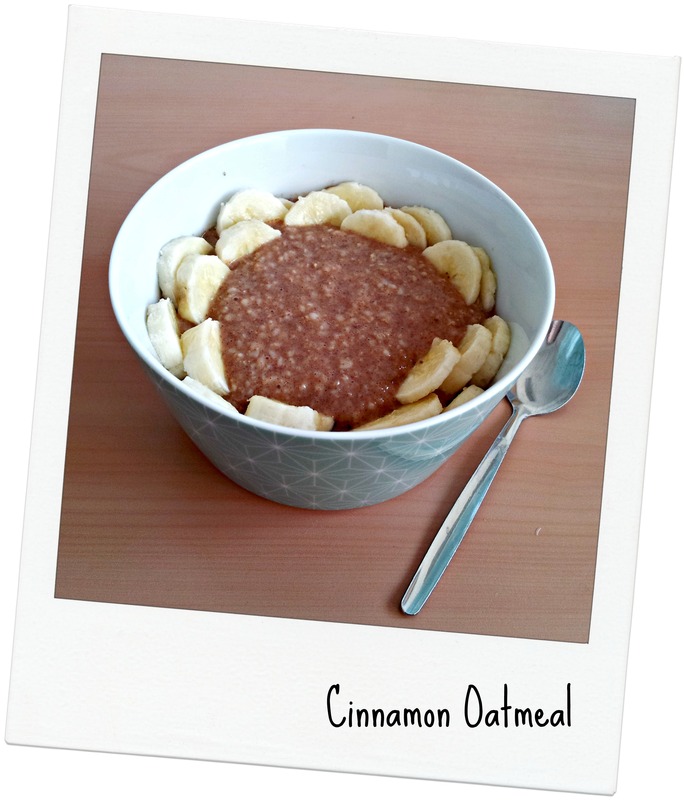 I had cooked me some cinnamon oatmeal with banana but it turned out a bit watery and not as good in taste as I had anticipated. I huge cup of coffee followed. Then I slowly started to feel better. The morning passed in the usual craze and luckily the lunch break came soon. 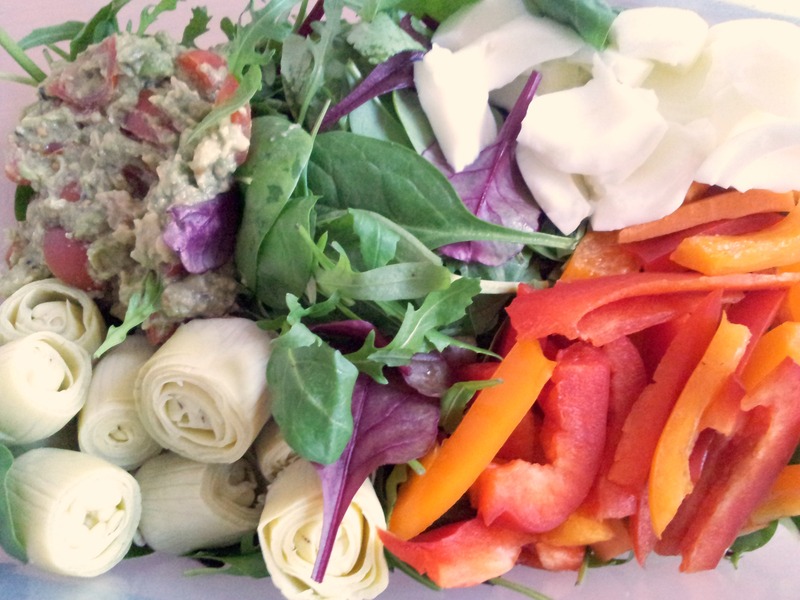 I am still all at including more veggies into my diet. Fortunately that matches my current cravings 100%! 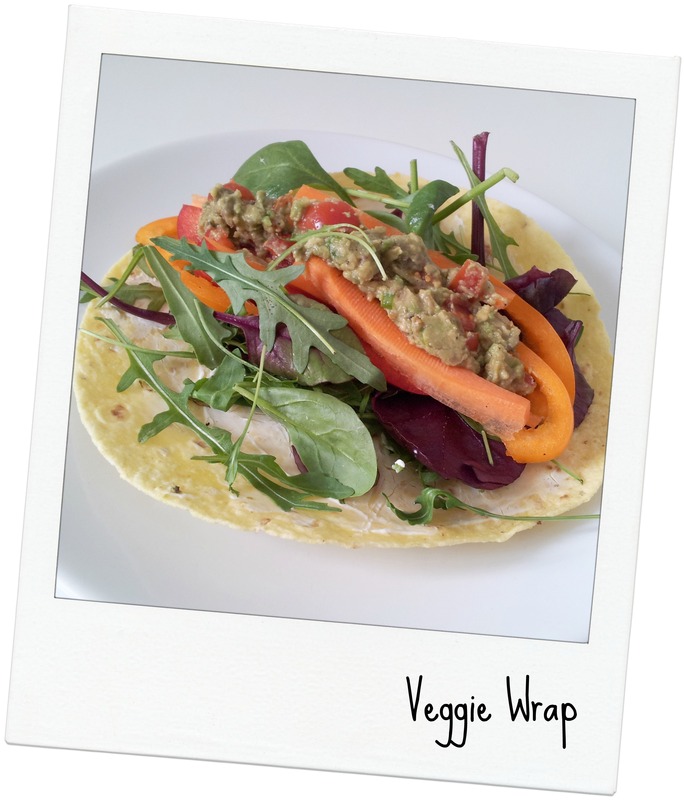 So for meal #2 I had a very yummy veggie wrap with a huge ladleful guacamole on top. In texture and taste it absolutely made up for the unconvincing breakfast! The afternoon passed very slowly but not without some annoying last-minute cancellations for tomorrow’s workshop. Sometimes I can’t believe how impolite people are. If it doesn’t cost a fortune many people don’t really make any effort at all! To cheer me up I had a great chia pudding waiting for me in the fridge. 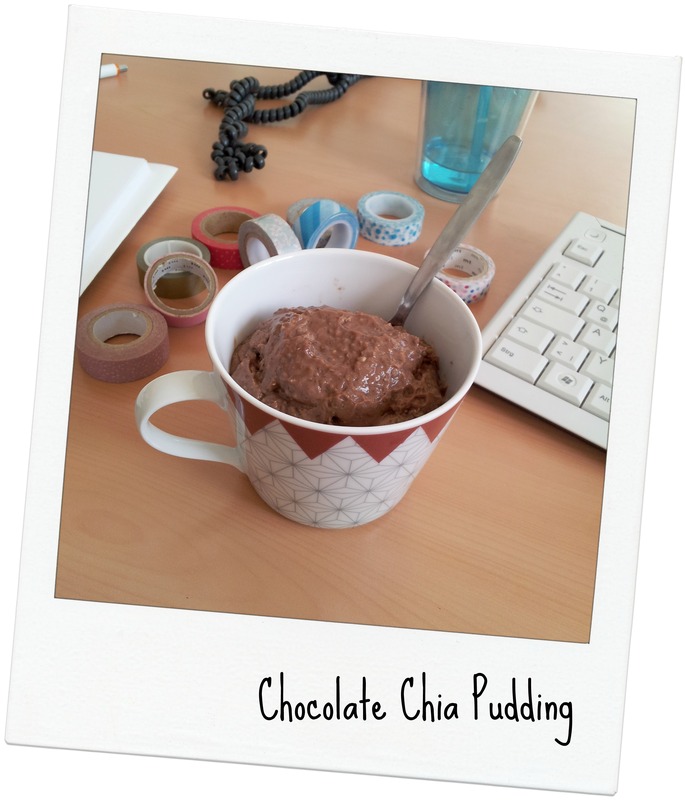 I used my new Sunwarrior Chocalate Protein Powder from London and I loved every single chia seed! I enjoyed a coffee along but my headache didn’t get better. 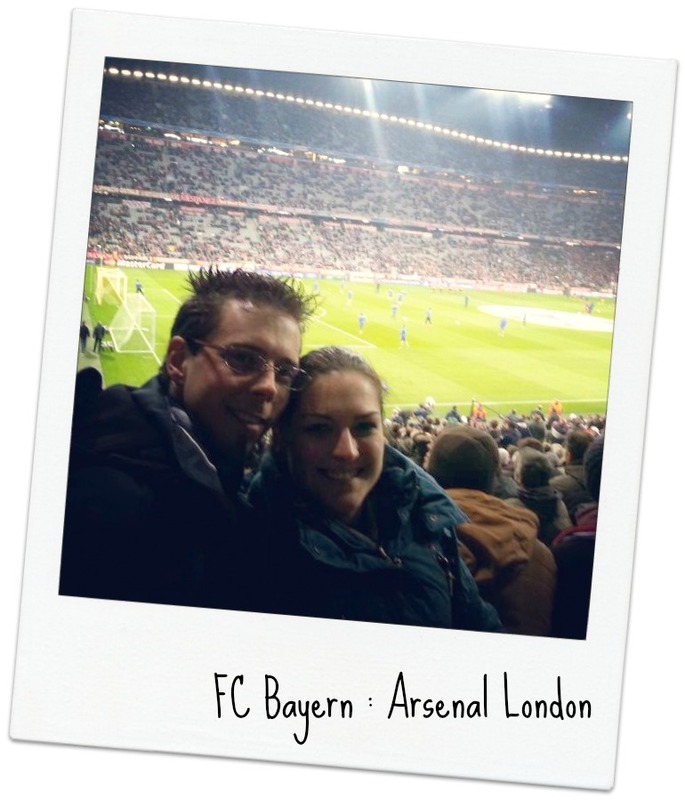 We arrived at Allianz Arena around 7 pm. We had access to the VIP car park which was such a great advantage! Stefan’s cousin picked us up in the parking garage and lead us to our seats. We were placed in the lowest gallery where we had a great view! We had so much fun! The match was okay and ended in a draw. Since Bayern had won the fist leg they qualified for the quarterfinals nonetheless. It took us ages to leave the car park and we arrived at home at 1 am. Hahahahaha I live next door to Sydney’s Allianz Stadium. Okay, random story. That chia pudding looks so good, but Sunwarrior reminds me of dirt! do you have the recipe for it? It looks so….puddingy. Sunworrier reminds you of dirt? In looks or taste? Because I found it way batter in taste than any other plant based protein I tried so far! As for the recipe I blended 3 tbsp chia seeds with 1 scoop protein powder, 1 tbsp cacao powder, 1/2 cup water, 1/2 cup soy milk. Next time I would rather add a little more liquid. Then I put it in the fridge overnight. I liked it. The texture was good but could improve with some more liquid! Taste was great! Your dinner looks fabulous! What kind of dressing did you use for the salad? I actually didn’t use any dressing at all as I had a huge batch of guac. The artickokes were pretty soggy too and added more sauce to the whole salad. I usually make a dressing out of mustard, sriracha or other hot sauce, argave syrup and a little water.